We've been on the road 10 of 12 weeks and are down to one race before heading home. Although neither of us can wait to get back with Mom and Bonnie, Scott is holding up well. His energy is high and his focus is excellent. Glad we didn't do the Panorama NORAMS. Scott scored in the second Giant Slalom yesterday, despite two major errors in the second run. He finished 16th of 131 and third for his age group. Today we switched to Slalom. The snow was good and hard and the two course sets were as different as could be. Scott made the adjustments well and scored his best Slalom result to date, a FIS 43. He was 18th overall and second in his age group. A Slovakian boy who is amongst the top 16 year olds in the world for slalom edged him out by .10. Tomorrow's another day! 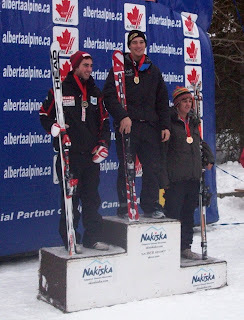 Scott raced the first of two FIS Giant Slalom races at Nakiska today. He started 30th and was 21st after the first run with a mistake just before the flat section. It was painful to watch him creep along to the next pitch -- tick tock. The same mistake on a different section of the course, and he might have been a second faster. The second run went much better. Scott had the third fastest run on the day and climbed to 15th place (1st for his age group) scoring a 49 point result. I was very pleased how he took the lessons from the first run and put them into effect the second run. The track held up very well today and their's no measurable snow in the forecast. Temperatures are dropping and we should have perfect conditions for the second race tomorrow. I couldn't have written a better scenario. 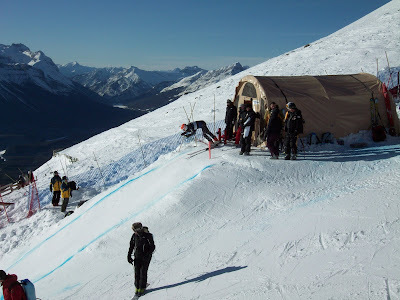 The decision to pull out of the NORAM at Panorama, BC was tough. Glad we stuck with it. 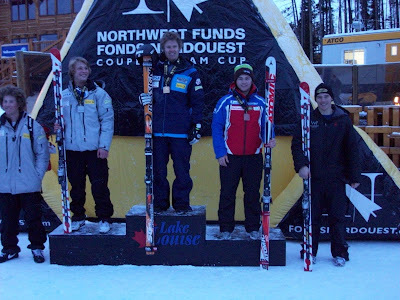 Since then we had three days at Jackson, WY where Scott raced slalom two days and trained giant slalom one day. He also ice skated two of the days. Nice and relaxing; he's totally caught--up on school! We left Jackson a day early and drove to Bozeman, MT to visit Bonnie. The kids skated, we all hung out... more relaxation. We then completed the trip to Nakiska, Alberta where he will race for four days. This morning we hit the slopes early in hopes of finding a race course. The home team was training Giant Slalom so we joined them for four quality training runs on a full length course. We got "home" early, finished school and skis, and even had time for a movie. I'm hoping this psychological and physical R&R has Scott ready for tomorrow. It sure looks like it. Since "hiking" has been Scott's favorite activity this weekend, I thought I'd share my thoughts on the matter. First, the daily report... Scott had another blazing run today, except for a 5 second hike to get back into the course. Neither of us is particularly concerned at this point, as this race series was to be prep for Canada. Once again Scott attacked hard on the fast line. However, the fast line leaves little margin for error and he paid big. That's OK though, as he knows what he did and he's gradually getting the touch and timing back. Now let's discuss hiking. 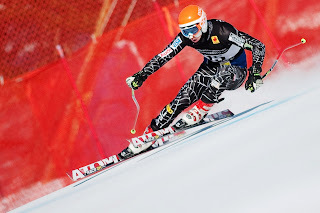 When a racer misses a gate, or flies out of the race course, in a tech (Slalom or Giant Slalom) event, he has the option of pulling off to the side of the course and quiting, or climbing back up to retake the missed gate and continuing on course. In competition most racers don't bother hiking, especially in the second run of the race. However, Scott is not like most guys. Our team rule is that athletes "hike" whenever they miss a gate, whether in training or competition -- whether in Slalom or Giant Slalom. My philosophy is that not doing so fosters a defeatist attitude. It creates athletes who bail out whenever the going gets tough. If an athlete knows that he/she will have to hike if a gate is missed, the athlete will try to save the turn, get creative, make the gate. ANYTHING to avoid a high stress, anaerobic, uphill hike! I can't tell you how many times I've watched Scott save a turn. Often those runs have been the winning runs in a race. When we were at the Topolino Shootout three years ago, where the top 20 boys competed for one spot on the Children's World Championship team, Scott made an interesting comment during the practice day. As we rode the chairlift he watched athlete after athlete abandon the course when they got a little off-line or late. Finally he said, "These guys are going to lose, they're all quitters." Scott won 5 of the 6 races the next two days. None of his runs was letter perfect, but he knew how to hang on. One of the best moments in our sport was during the 2002 Olympics at Salt Lake City. Bode Miller had already medaled twice and become an American icon. In his final event, Slalom, he entered the second run leading the field. True to his nature he never let off the throttle, pushing the limits of his ability. He missed a gate, and hiked back up even though he had no chance of placing. He reentered the course and missed another gate. He hiked again. Bode hiked three times that run, but finished. I will always admire him for that day -- better than any medal! We're at Snow King in Jackson, WY now for two FIS slalom races and a few days of tech training before heading back to Canada. Scott was "in" the NORAM tech races at Panorama, BC this week, but we decided it was best to withdraw and get fully prepared for next week's tech races at Nakiska, Alberta. A lot of folks think we're nuts for pulling out of a NORAM opportunity, but I'm trying to manage the mental and physical stress of competition. It's a long season and Scott needs to be functioning at a high level in March when all the Championships come around. Jackson is one of our favorite places. We stay in the same hotel every time, know all the local restaurants, like the ski team staff, and of course... they have a hockey rink for Scott! Coming here is good for us. The FIS slalom series this weekend offers Scott some realistic, race-day, preparations without a lot of stress before we head back to Canada. Scott skied extremely fast today on both runs. I mean really fast. Unfortunately, each run included a departure from the course and the ensuing hike to get back in. Needless to say, he didn't score. Today was Scott's first time on slalom skis since Nov 17th, and he skied very well (despite the blow-outs). He showed he has the tools to win big tomorrow, so we'll go from there. No matter what the outcome, this has been the perfect chance for him to "tune-up." Scott (the only one in a non National Team coat -- far right) finally nailed the "Fall Away" turn on the hill and posted a huge finish yesterday at the Lake Louise NORAM Super G. Starting with bib #60, he finished 22nd overall, 5th for all Juniors (19 and under) and 1st for his age group. He earned a 38 point FIS result (good enough to move him to #2 in the world for Super G in his age group) and garnered his first NORAM points. That's a mouthful, so let's sum it up as a happy day for Scott. After the race the coaches and athletes had to take down 900 "B" nets, roll them, and move to the bottom of the mountain... two hours of hard work. Everyone carried their load, including international athletes and their coaches. Nice to see. Scott and I finally hit the road around 5:30PM headed to Jackson Hole, WY. It was a long drive through VERY rural Alberta and Montana. We encountered three herds of horses on the road (close call) and didn't find a hotel until 12:30AM. We arose at 7AM to resume the trip and made it over the pass into Jackson at 4PM in the midst of a snowstorm. I attended the 5PM Team Captain's meeting and waxed skis, while Scott did schoolwork left over from yesterday. We're now headed to bed. Tomorrow starts with a 7AM chairlift to set courses. Scott races slalom tomorrow and Monday. "Downhill racers are like good wine; they have to age to reach their prime." Cory Murdock, ex US Ski Team downhiller and pro skier. So we're learning... Scott is skiing well, but his unfamiliarity with this track is showing when competing against an older field who has raced here many times before. He just finished his second NORAM level downhill today. We switch to Super G tomorrow. This has been a great learning experience for Scott. He is getting to run the World Cup track from the men's start, a two minute race and a real thigh burner. He also is learning just how important timing and the affects of micro-terrain can be to outcomes. Each day he's run here (four) he's fixed one problem and found a new one. There's still one critical turn he has yet to master. Notwithstanding, he posted very respectable results of 36th and 37th overall in the two races. He handily topped his age division every day and beat a number of US Ski Team members. Although disappointed that he didn't improve his FIS points, Scott is pleased with the outcome relative to the field and the challenging hill. Tomorrow will be one of those long days to which ski racers become accustomed. We get up early and finish packing the car, check out of our rooms, follow a similar race schedule extending from 7AM to 3PM, then we go back up the hill to help take down all of the protective netting on the 2 miles course for about three hours. After that we'll hop in the car and try to knock off six hours of the trip to Jackson Hole, WY, where Scott has a slalom race on Sunday. So, having reread the preceding paragraph, I'm heading to bed! The 2009-10 season is officially under way for Scott. 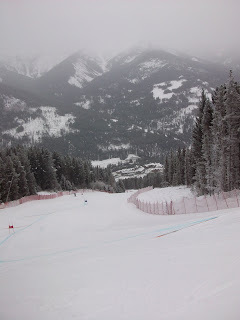 Today was the first timed training run for the Lake Louise NORAM downhills. Weather was the big story here as athletes contended with minus 35F temperatures and the accompanying "grabby" snow. Top speeds barely passed 70 MPH and the longest jump was limited to about 50 meters. The field this year is somewhat unusual for a NORAM. 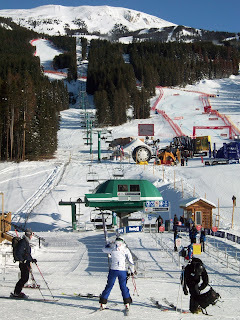 Due to the lack of snow in Europe a number of World Cup and Europa Cup racers stayed over for this race. Additionally, the US team is here in force with about twenty athletes. Add a similar mix from the Canadian team, and we're thinking the points should be pretty good come race day. Scott skied well and finished where he started, 38th. This being his first time on the track, he had some timing and orientation issues which slowed him down. He also had a major goggle fogging/icing issue which imaired his vision. That said, his jumps were rock solid and the turns were skied well. I look for a good jump up the standings during tomorrow's practice run. We got up early and packed out for the two hour drive to Lake Louise this morning. The goal was to arrive in time to watch the women's World Cup Super G. We missed the first few racers, but did get to cheer on a number of US girls, including Lindsey Vonn who eventually settled for the Silver medal .o3 seconds out of the lead. The track looks great and I talked to a friend who worked the World Cup and he reports excellent conditions. So now the only challenge will be the weather. The forecast calls for ambient temperatures of minus 35 F for the next couple of days. Sometimes they cancel events under those conditions. We've secured athletic tape to create a mask for Scott's face if he does run, and will be taking all of the precautions for his feet and hands. The wax testing.. For those interested, we were surprised to find the newer skis to be .15 faster over an 18 second test course. Given that both skis are exceptionally fast, we'll be using Scott's newer, slightly stiffer (for ice) skis this week. We have the coldest wax we own on the bases and have had great success with this wax in snow temps down to -19 F in the past. So finally, after weeks of training and preparation, the first timed downhill run is tomorrow. Can't wait! Oh yeah, the photo is of the bottom 1/3 of the course. Does the photo look cold? That's because it is. The kids have been training in speed suits with temps ranging from minus 20 degrees F to the balmy 11 degrees F we enjoyed today. Managing clothes and warm-up breaks is a major focus, although the kids are largely expected to self-assess at this age. One athlete didn't do so well, suffering second degree frostbite on his big toe. He's now sidelined and I doubt he'll be ready to race at Lake Louise. This has been a great week. The project is being run by the Western Region coach, Jeff Pickering, and he brings just the right mix of control and levity for this group. We've had some great course sets on good, hard snow, and minimal, to-the-point, meetings in the evening. I think the athletes will leave here well prepared and adequately rested. For Scott's part, this has been an important week. His knee shows no symptoms of inflamation, so he's able to ski full bore. He's posted strong times against very fast company, and is having a great time with the group. He's in excellent position for a good week at Lake Louise. A big part of ski racing is managing resources. One resource is the athlete, which needs to be healthy, well fed and mentally composed. These things don't just happen, there is a lot of behind the scenes planning that goes into it. Hence my compliments to Jeff. Another major component is equipment. I'm pretty excited about where we are in that regard. We've been "running in" Scott's new Downhill and Super G skis this fall, while leaving his "uber fast" skis from last year on the rack. I'm really pleased with how the new skis are running and was able to secure an opportunity for timed testing of all the skis tomorrow. So Scott and I spent tonight ensuring that all his skis are tuned and waxed identically for the tests. Although I suspect the old ones will still be quicker, I want to see how we're coming on the new ones. Don't laugh -- this stuff is exciting to geeks like me! After a wonderful four days at home with the girls, we're back on the road. We left Monday for Panorama, BC and a preparation project for the Lake Louise speed events. This is perfect for Scott, as he missed several training days the final week in Colorado and hasn't been on speed skis yet this year. After training Scott "ran in" his 2009 Super G and Downhill skis. Although they have more than ten coats of wax (including three hot box sessions) he won't be racing those next week. Last year's skis are running really fast so we'll stick with them for a while longer. Tomorrow Scott will train Super G with the BC Ski Team (untimed) then switch to Giant Slalom the second session, which will be timed. We're gradually ramping up, with more intensity each day. We love Panorama for training, but the internet service is abominable. Scott is struggling to get just a day of work done, let alone get ahead for race week. He had 26 pages of Physics which took nearly two hours due to load time. Now, after the group meeting, we're back in the base lodge plugging away.